Good news for all our call center software users and fans! Aircall has been rewarded as a Call Center Software Leader by GetApp’s quarterly ranking, raising directly to the 2nd place! We are happy to see that GetApp acknowledged our dedicated hard work. 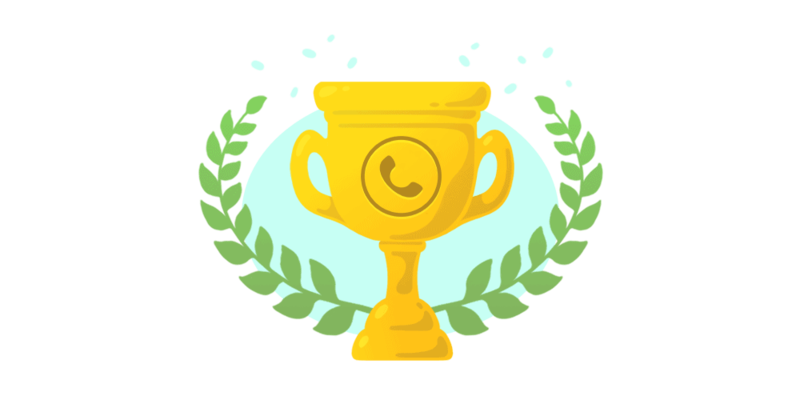 Aircall won second place in the Q4, the most recent of GetApp’s evaluations. GetApp, which has been recently acquired by Gartner the world leading technology research company, is a business software discovery and research platform that is analyzing any business software in order to compare it to its peers. For this ranking, GetApp analyzed more than 25 call center softwares and topped Aircall as one of the best cloud-based call center software in the world, just behind French historical leader Vocalcom. In fact, GetApp took into account many different ranking factors, such as user reviews, integrations, mobile platforms, media presence and security. Among them, Aircall has the highest score in customer reviews and mobile and second-highest in integrations. Aircall’s score is 62 and it is incredible considering the fact that we are a new company, with only 2 years of existence. Our teams worked hard to get the product to the next level and we continue on delighting our clients every day. We also had the support or US-based VC that believed in our work and recently invested in our growth. Our cutting-edge call center software is filled with advanced features including live analytics and collaborative features that empower your agents. These include: managing your numbers and users in one place (even if they’re spread all over the world), flexible call distribution, assigning and commenting on calls, unlimited concurrent calls, custom working hours or forward to cell phones. Our scalable call center software adapts easily to your business’ support and sales needs. Since our launch, our product has maintained its core fonctionality. Meanwhile, it has gradually become more robust. We’ve added features meant to enhance the customer experience, like smart queuing, IVR, CTI, or skill and time based routing. So take a look at our video tutorials made in collaboration with GetApp earlier this year. You’ll be able to see what Aircall’s business phone system can do for your business. Our 2nd rank in GetApp’s top 25 Call center cloud-based apps is a step towards our goals. We are happy and proud to be part of it!